We’d love your help. Let us know what’s wrong with this preview of Your Next Move by Michael D. Watkins. After three months in a new job, are you up to speed? Will you sink … or swim? Transitions into new roles are the crucibles in which leaders get their toughest tests, and they're the defining factor in professional careers today. Yet far too often, leaders fail to move effectively into new roles. The resulting costs are high, for your career and the organization. In Your Nex After three months in a new job, are you up to speed? Will you sink … or swim? Transitions into new roles are the crucibles in which leaders get their toughest tests, and they're the defining factor in professional careers today. 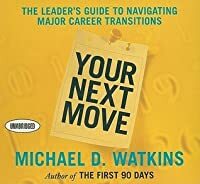 In Your Next Move, Michael Watkins shows how you can survive and thrive in all the major transitions you will face during your career, including promotion, joining a new organization and making an international move. With real-life examples and case studies, he illustrates the defining hurdles associated with each type of transition. To ask other readers questions about Your Next Move, please sign up. I brought this book because there is a certain kind of uncertainty in my current company. The title seemed to talk to me: what will I do if I lose my job? What will I do? What is my next move? Then while reading, I realized that I got the wrong book. This one assumes that you are already in your new environment: new job, new promotion, new company, international posting, etc. It is not about losing your job and a guidebook on how to either find another job or start your own business or whatever. Ho I brought this book because there is a certain kind of uncertainty in my current company. The title seemed to talk to me: what will I do if I lose my job? However, it is still okay. The book talks a lot of sense on how to adapt yourself in those new environments. It gives sound advises on management, leadership, organizational alignment, persuasion and influence and what-have-you. I breezed through my reading as many of those don't seem to apply to me. Had I read this 5-10 years ago, those would have been more interesting if not useful. Unusually for a 21st Century business book, this isn't littered with jargon or mystical mumblings (although it's not entirely free of it: almost every action is "leveraging"). But it doesn't sink to the ridiculous depths of Clever or The Idea Hunter. It uses plausible examples to show the challenges facing executives undertaking their next step up and offers practical, generally sensible advice on how to tackle those problems. Despite what the title might suggest, it isn't a handbook on how to s Unusually for a 21st Century business book, this isn't littered with jargon or mystical mumblings (although it's not entirely free of it: almost every action is "leveraging"). But it doesn't sink to the ridiculous depths of Clever or The Idea Hunter. It uses plausible examples to show the challenges facing executives undertaking their next step up and offers practical, generally sensible advice on how to tackle those problems. I had thought it was a career development book, fast read, more of a sequel to Watkins' The First 90 Days. Definite food for thought and worth a skim, or diving into specific chapters. Preferred his other book (First 90 Days) more to this. It was a little more specific to business cases and not necessarily as applicable to other arenas. Got a few tips above the other book but not much. This is excellent material. I am working through it again and each read harvests deeper insights and practices. Michael Watkins' sequal to "The First 90 Days". In this one, he brings practical insights and practices as he applies his STARS model to a broader variety of executive transitions including: promotions, leading former peers, international assignments and assignments where broad and significant influence without direct authority is required. It provides excellent insights to experienced e This is excellent material. I am working through it again and each read harvests deeper insights and practices. 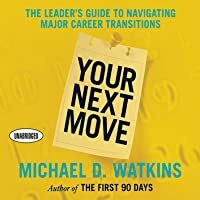 Michael Watkins wrote a very good book called The First 90 Days, and this is a follow up volume about how to handle career transitions. Unfortunately, the advice here rarely rises above the commonsensical. There are a few useful checklists of what not to forget when you start a new job, but beyond that little new ground is broken here. This book provided case studies and relevant studies highlighting seven types of transitions a leader will be required to make in their corporate career. While the tone and style is not as engaging as other books (at times even didactic), overall the information provided is useful. The author has a great narrative style. The book resonates well with the realtime scenarios that one may encounter in corporate world. Practically compiled well, summarizing a phased approach one can take to deal with/prepare for such scenarios in one's career. Amazing read! 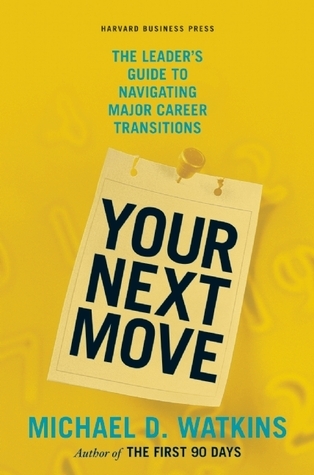 This is a very useful book to understand different types of scenarios (STARS) that one can expect during a career change through promotions, change in responsibility, new organization, new geography etc. This book is written for high level executives. Even so, it has useful cautions for being promoted over people who formerly were your peers, adjusting to a new level in the organization, adjusting to a foreign assignment, etc..
To be read with "the first 90 days"
Similarly to The First 90 Days, it focuses on upper management transitions. Yet, the Checklists at the end of each chapter provides broad questions which are useful at any level. Awful. Couldn't get through it. Boring and simplistic. The book covers a few common management transitions including promotions, onboarding, and moving to a new country.